The Deep Ocean reference ANN0982 is the second timepiece I’ve reviewed from independent watch brand Andersmann. Once again, I find myself immediately charmed by what is a real tool watch and a pure expression of what many enthusiasts are looking for in a beefy yet simple daily dive-style watch. 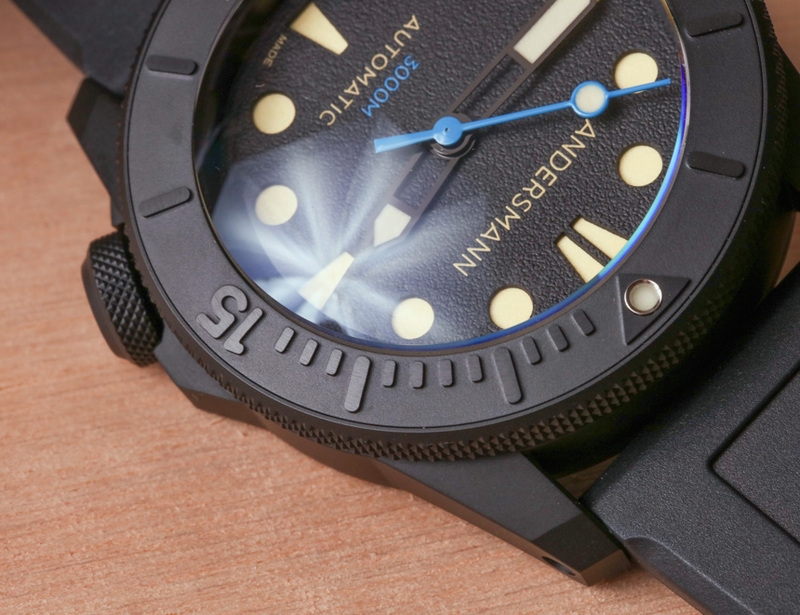 With that said, for a watch of its style, the Andersmann Deep Ocean 3000M is on the pricier side – so let’s see how appealing the features and overall wearing experience are. The Andersmann Deep Ocean is about 800 Swiss Francs more than the Andersmann Oceanmaster II timepiece that I previously reviewed from the brand, but you do get more sophisticated features and additional construction complexity. At about $2,500, the Deep Ocean is likely about has high as many collectors are willing to invest in a watch – no matter how pretty – from a newer brand that doesn’t come with the cache value big name luxury watch brands have which collectors rely on for resale value. As cool as the Deep Ocean is, if you want to sell one, you’ll need to find someone else who agrees that it is just as cool. This point is important to bring up because I find that many watch collectors with the open-mind to purchase from smaller brands are also the types of enthusiasts who like to shift around the pieces in their collection – which means a lot of sales and trading activity could be going on. I’ll also bring up the same comment that I made when reviewing the Oceanmaster II, and that sentiment is how I am not entirely sure how I feel about the fact that Hong Kong-based “Andersmann” (apparently “Anders” is the name of the founder’s son) is a name designed to sound European, while the website prices the watches in Swiss Francs. It is true that Andersmann timepieces are assembled in Switzerland and given a Swiss mechanical movement, which is beneficial due to the “Swiss Made” designation. With that said, founder Raymond Chan started the company as a watch lover in Hong Kong, and given my respect for both the people in Hong Kong, and the watch appetite for the city, I do wish the more authentic home of the brand was celebrated a bit more in the branding on the website. It is a minor thing, and it is also the case that Mr. Chan likely wants the products (not his story) to be the focus of the company. I get all that, but I still wish I was more immediately reminded of who to thank when wearing and enjoying the watch. 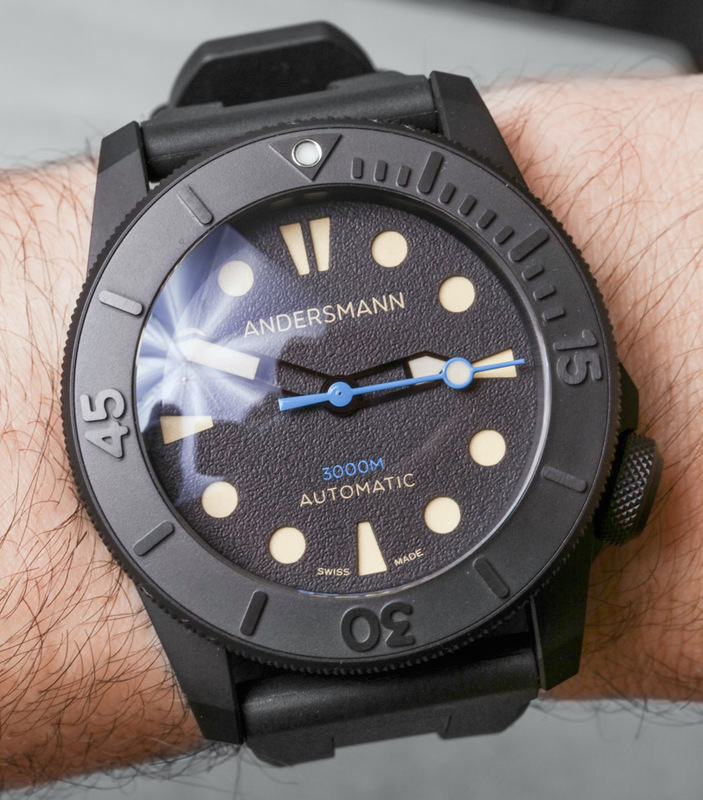 The Andersmann Deep Ocean is a serious deep diver born of the design school of thought where simplicity and strength make for a good watch design. 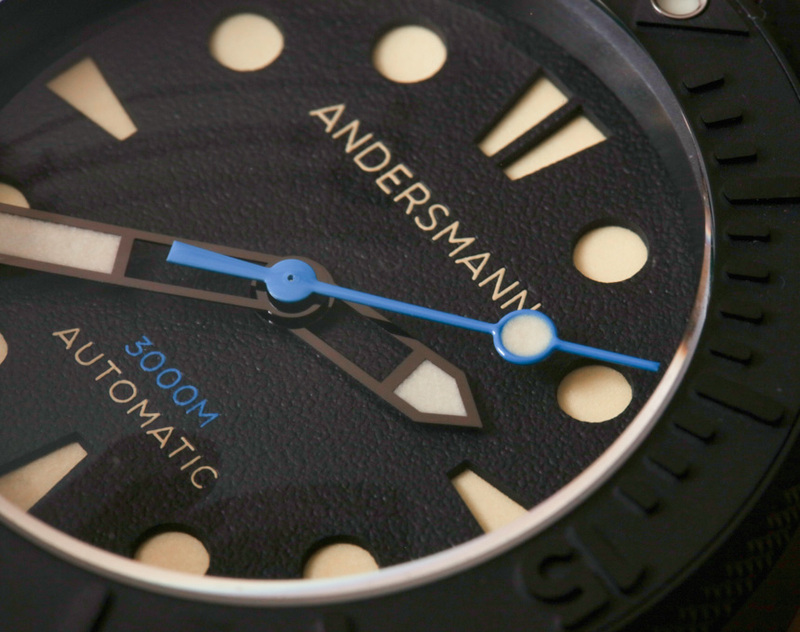 I applauded the “design restraint” of Andersmann’s original watches and likewise appreciate the Deep Ocean. In theory, all of the brand’s watches are essentially the same thing – a simple daily dive watch that is thematically inspired by the same appeal a Panerai has. This simple focus on utility, streamlined looks, and not too much fuss allows the watch to be fashionable and conservative, which allows it to work in a range of situations. 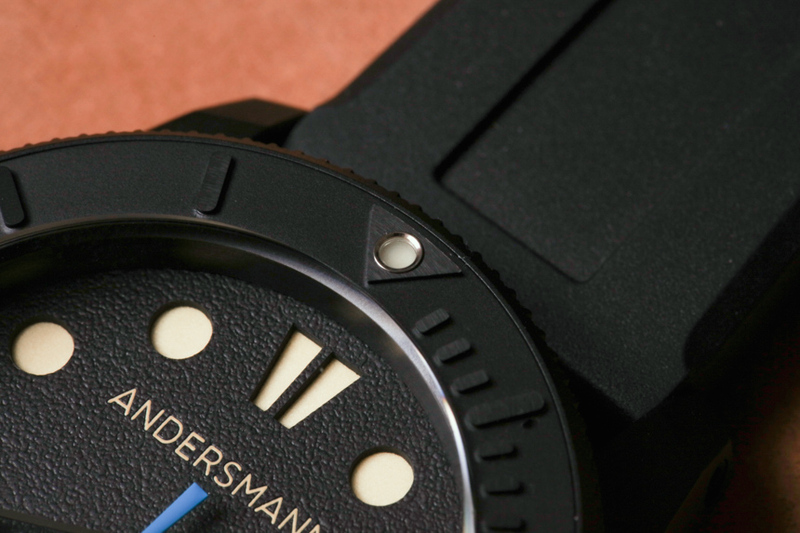 Likewise, Andersmann includes both a rubber and a leather strap which you can play with. The rubber strap feels like an upgrade in material from that used on the Oceanmaster, and while the style of the leather strap isn’t for my taste, if you can find 26mm wide straps, you can fit anything you like to the case. What all Andersmann watches have in common thus far is the movement they use, which is a Swiss ETA 2892-2 automatic. This higher-grade three-hand automatic was visible through the sapphire crystal caseback window of the Oceanmaster, but the Deep Ocean has a solid caseback – for good reason. The movement is capable and reliable, with a 4Hz (28,800 bph) operating frequency and about 42 hours of power reserve. The dial of the Deep Ocean features just the time, and (as in the Oceanmaster II), there is no date window. The omission of this functionality (which the 2892 movement does have) is done in order to make the dial entirely symmetrical, as well as to satisfy the desires of many watch enthusiasts who feel that these days they don’t need a date window (they can learn that information elsewhere) and prefer a more purist look to the dial design. 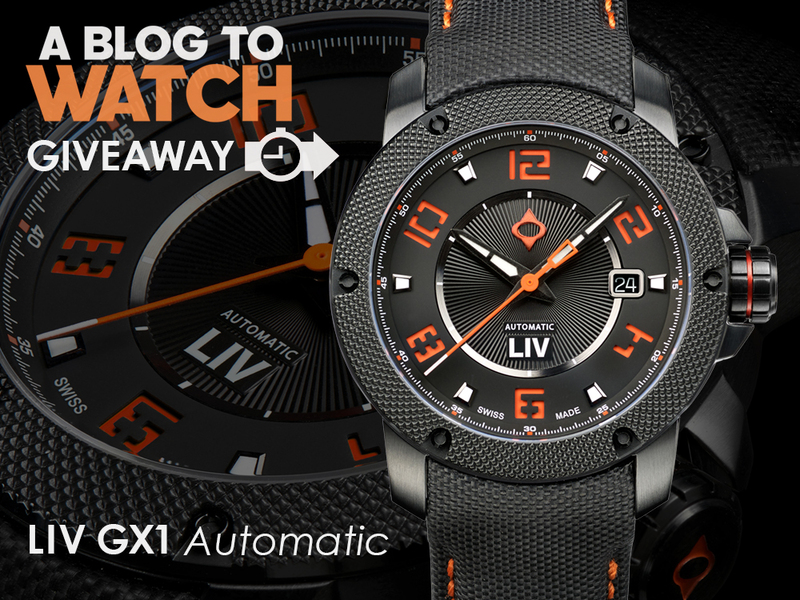 It’s the best looking watch they’ve done by far, but the price is too high. I know it’s titanium, but is that really worth a CHF 1,000 premium over their Ocean master II? Not to me it isn’t. Given many of the offerings at the Hong Kong watch fair, it’s probably best that Andersmann don’t pay greater homage to their background. 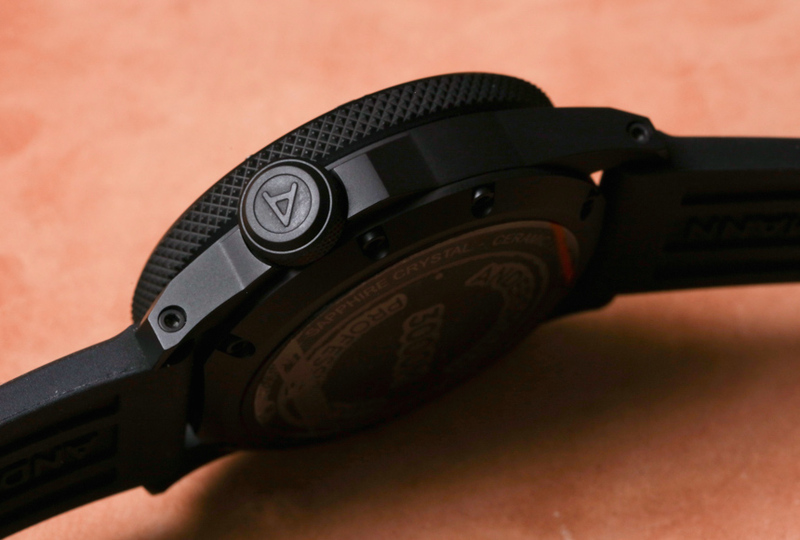 47mm is of course a hefty case, but if you feel comfortable wearing it, then why not…? for the usual microbrand divers 600 bucks I would have called it super boring but still at least somewhat ok. yet another mixup of the usual designs, but at least they tried to be a little bit different with the dial. within the neverending swamp of microbrand divers anything remotely different is worth something. but sorry, for 2,380 CHF it’s just an horribly overpriced turd. Pretty hard to find an ETA 2892 in a 600 buck watch. but not because the 2892 with it’s 80 or 100 dollar surcharge to a 2824 is such a fancy movement. 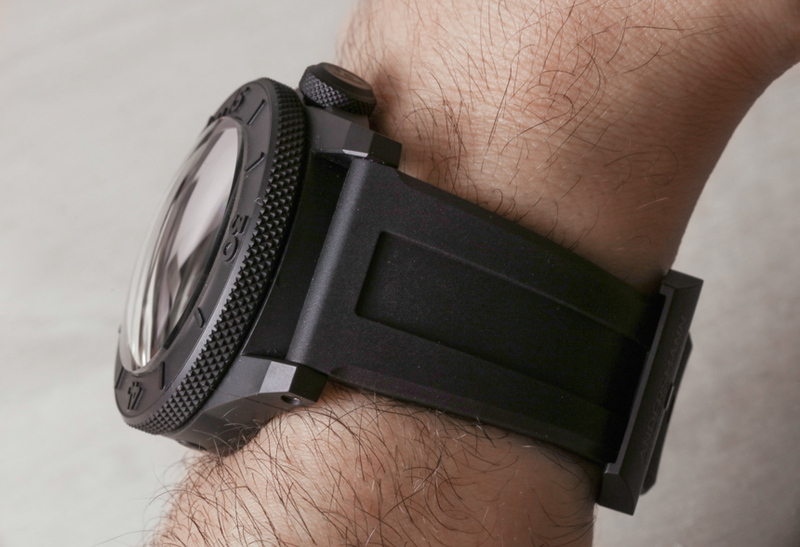 it’s just that nobody cares to put it in a nasty microbrand diver. for those even a 2892 is casting pearls before swine. This may be an attractive option for someone who likes the way current Panerai “faces” are styled (sandwich dial, faux patina, black and light blue) but can’t afford or does not like the Panerai brand . This is a really pretty watch and I like just about everything about it. Sadly, my twig-like wrists and arms won’t accommodate something of this size. A pity. Out of interest, where are you seeing the awful finish? Is it that you don’t like DLC. The bezel looks horrible and the numbers cheapens the hole look. I remember a company called “D Watch” who was one of the first to offer fully customised watches — including case/dial/hands etc. and they offered a DLC case as well. If I recall correctly the price for the same thing you get here — even after full customisation — was less than half of what Andersmann is asking. Also I am pretty sure you can find a used Panerai sub for around 5K. Well, it’s large for sure and thick as well. In the normal market of desk dive watches this would be a hard sell given the size and price. But I think they actually did produce a real tool watch and everything about it reflects that. Outside of the sandwich dial construction, I don’t see this watch as being much like a Panerai. And while it has well known dive watch design cues, I’m so glad they did not just copy the dial and hands of a Submariner. I think this should appeal to the same customer as a lot of Sinn watches (as just one example of a serious tool watch maker). The problem is that Sinns look good but this one is the literal manifestation of dullness. A few Sinns look good IMO wile most of them have something odd about their looks which sorta spoils it for me. But what great no-nonense tool watches. Cheers. A bargain for the few brave boldly going down 3000 m.
Ha…”being secure on my wrist thanks to the strap….” That’s usually what the strap is for! Looks like a Resco. Alternative #1 Go buy a brand new SKX. Send it Motor City Watch Works and tell Jay you want a new bezel, a Yachtmaster insert, Panerai hands, domed sapphire crystal and a dial from any of the dozens of custom Seiko builders out there. Ask him to Cerakote the watch. Pay the $500-$600 charge on your credit card at the end of the month. Savings: Enough to take you and your significant other on a dive vacation for a week to the Caribbean. Alternative #2 Go Buy a Sinn U1 SE. Savings: Enough to take you and your significant other to a dinner at Red Lobster and regale her or him with tales of previous dive adventures. Alternative #3: Go buy that brand new Black Bay Dark on a bracelet with an in-house movement that’s up on Ebay right now for $2739. Savings: Your twinge of buyers remorse. I mean, this is all assuming you don’t absolutely NEED a $2500 47mm Frankenwatch built by a three year old Hong Kong company that thinks its pricing model alone is enough to even get them anywhere near the ‘sandbox’. nah. If I wanted a diving wrist monster why would I pick this over, say, a Zelos? Dr Renato Lazarus has vanished. Any idea where Bill Moonraker is? Doc disappeared last night and all his comments to me in a convo were deleted. He’s already wearing cement shoes and a cement cased watch. No idea. I hope he returns soon. Look for the new moniker on the scene. Of course he has a unique style that’s hard to miss so we’ll most likely know when the good Doctor returns. Where? No sign of him on my end…. I don’t mind the looks , but way too big and WAY too expensive . I just can’t see the value . I agree, it’s too big and ridiculously priced. The depth rating is useless and it lacks second or minute markers, despite having a second hand. It reminds me of numerous other microbrands that are far better values. A watch made for uneducated fools that don’t know any better. Save your money for a real watch. You didn’t have to freedom of speech.. You just left room for dialogue,. I used to really enjoy Simon Hell comments were colorful so you had to take them with the grain of salt. I like the design and it looks pretty will engineered from the photos. A watch that size, with a 26mm lug, really needs an articulated rubber strap to make it wearable. Andersmann should have taken a design cue from the Panerai 26mm rubber straps. 3000 meters? Seriously? Why not 10,000 meters (Challenger Deep)? Yes, a dumb phoney name. If he really thought about it, names like Rolex and Omega were never intended to sound Swiss at all. By using this phoney wannabe name he cheapens an otherwise sincere effort. 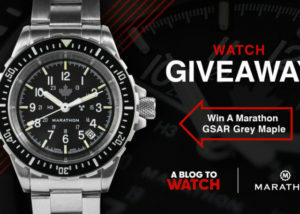 Other than that and the fact that 3000m is also silly, I kind of like this watch. Pretty expensive for a no-name brand, but seems to be a quality effort. Nice enough looking watch, but with so many new micros out there these days it’s getting harder and harder to place a real value on these things. Ariel, it’d be super helpful if ABTW started including the movement grade in your reviews, as I’m sure that’s a factor that can weigh heavily in the asking price. I know it’s probably not info included in a generic press release, but I’m sure could be gleaned via a quick email to the manufacturer. $2,500? Try Magrette Moana Pacific Titanium, 500M WR, Swiss STP1-11 automatic movement, ceramic bezel, sapphire crystal for $685. Or Deep Blue T1000, 1000M WR, Miyota 9015 movement, ceramic bezel and sapphire crystal on eBay new for $450. I just don’t see the 3000M WR as adding almost 2 grand in value. Pass. Not a bad watch but they need to be careful here as they’re entering Bremont and Monta territory where people see a huge divide between the price and the value proposition. They don’t have the pedigree to pull that off. Ironically, this is priced about the same as the newly discounted Monta OceanKing. From a distance the dial almost looks like Berluti. I’ve long been telling Andersmann they must do something with my Berluti brethren (over Sangria and many a wedge salad). Berluti – sublime and timeless, art in leather. Or over many Sangrias and just one wedge salad. Remember, kids, don’t edit your comments or they’ll be flagged. Not sure I’ve seen knurling on a bezel before. That’s something that stands out for me.